This drawing shows Colonel James Gillpatrick Blunt's court martial of pro-slavery soldiers on September 18, 1861. Pictured left to right are W.A. Johnson, Garnett; Col. Blunt, Fort Scott; Dr. Lisle, Chetopa; Preston B. Plumb, Emporia; Lt. Brook; and two unnamed soldiers. The trial took place in Little Town (now Oswego) in the home of pro-slavery supporter John Allen Mathews. Mathews had been killed by union soldiers from Fort Scott under Col. James G. Blunt's command. 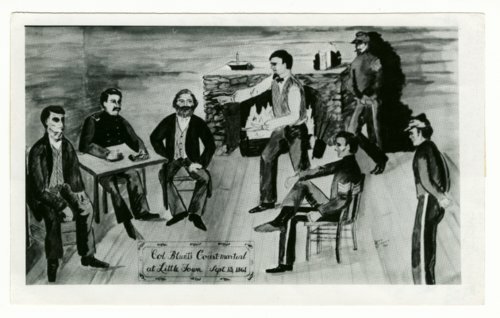 This drawing depicts Gen. James G. Blunt's 1861 court martial and helps the student understand the relatively simple manner in which military justice was meted out during the Civil War. In addition, this drawing helps facilitate discussion about the violence that continued to rock Kansas throughout the conflict as pro-slavery and anti-slavery forces continued to clash.